Jim Lahey’s no-knead method is so amazingly simple that it’s quite tempting to fiddle with it, making substitutions here and there, pushing the limits. One of the more obvious changes is to swap the white flour for whole wheat. It’s more nutritious, just as easy, and surely there can’t be that much difference, can there? How hard could it be? Plenty hard, as I found out. Merely changing the flour to whole wheat resulted in a gray, flat loaf, with a gummy texture that tasted vaguely like despair. So, to remedy that failure, I borrowed a few tricks from the best no-knead variation I made, Cook’s Illustrated’s almost no-knead bread, plus one from King Arthur Flour’s whole wheat sandwich bread. I was unwilling to add any white flour back in, as I still wanted a 100% whole wheat bread, though that certainly would’ve helped things quite a lot. For this attempt, I used half beer and half water for the liquid, similar to almost no-knead bread. As suggested by the King Arthur recipe, I added a splash of orange juice, not for flavor, but to offset the bitterness that some whole wheat flours have. This also provided a little acid, so I didn’t feel it necessary to add any vinegar, as the Cook’s Illustrated recipe does to improve the flavor. I kept the method the same as the original no-knead bread, for consistency. The result was absolutely improved. That unappealing gray color was gone, replaced by a proper autumn-leaf brown. 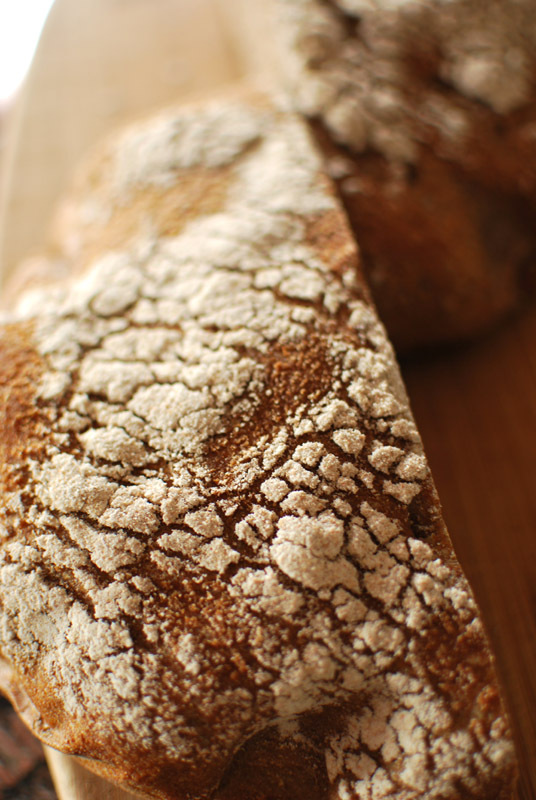 The crumb was beautifully open, and the domed top spoke volumes about the far better oven-spring. Flavor-wise, this bread was the clear winner between it and its predecessor. The crust was appropriately thick, and the interior was tender. However, this still isn’t the ultimate 100% whole wheat no-knead bread. While the flavor was good, the texture was a bit coarse, lending a dryness to each bite. The modifications I made to the recipe made worlds of difference, but it’s not quite there yet. 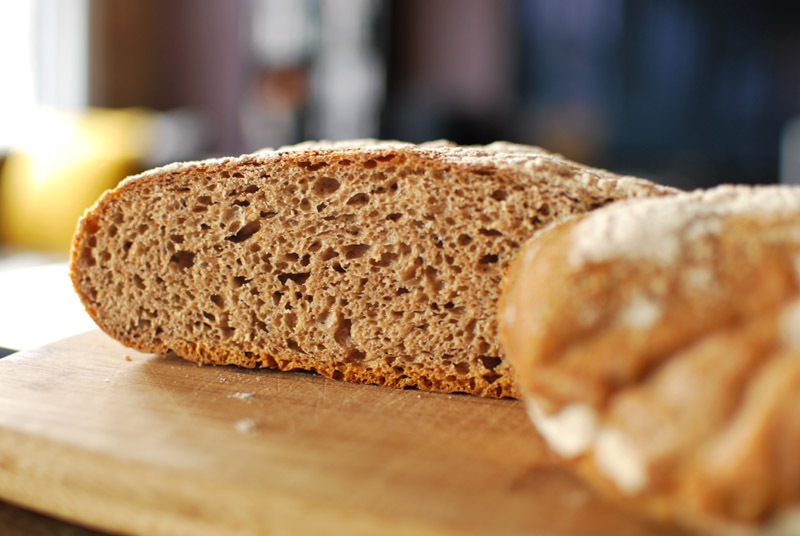 This whole wheat bread is good, and will certainly fit the bill if you must have a whole wheat no-knead bread, but there are finer whole-grain examples that take a shorter amount of time. 1. In a large bowl, whisk together the flour, yeast, and salt. Add the water, beer, and orange juice, and stir until blended; the dough will be shaggy and sticky. Cover tightly with plastic wrap, and let dough sit at room temperature for at least 12 and up to 24 hours (but preferably about 18). 4. At least 30 minutes before baking, preheat the oven to 500º F. Put a 6- to 8-quart heavy covered pot (see note 1 below) in oven as it heats. When the dough is ready, carefully remove the pot from the oven. Transfer the dough to the pot by lifting the parchment by the edges, and carefully and quickly lowering the dough into the pot. Shake the pan once or twice if dough is unevenly distributed, but don’t worry about it too much; it will straighten out as it bakes. 5. Cover the pot with the lid and transfer the pot to the oven. Reduce the oven temperature to 425º F, and bake for 30 minutes. Remove the lid and bake uncovered for an additional 15 to 30 minutes, or until the loaf is well-browned. An instant-read thermometer should register around 205º to 210º F when fully baked. Transfer to a wire rack to cool thoroughly, discarding the parchment. 2. My liquids (water, beer, and orange juice) were cold when I added them. I’m not sure if that makes a whole lot of difference or not; proceed at your own discretion.